Our friends Joan and Jerry Borton work for the Philadelphia region of Joni and Friends, run by Joni Erickson Tada. Joni and Friends is a ministry to those with disabilities in the name of Jesus. Jerry was born with Cerebral Palsy and is limited to a motorized wheel chair. It is so fun to talk with Jerry about everything from ministry to baseball to good food to college football. I am a Michigan fan...he, problematically, an Ohio State fan, but fortunately the bonds of Christian brotherhood run deep. So I forgive him (sort of). Joan and Jerry are a great team together and have so much joy. I love being around them. Each year the Bortons run three week-long summer camps for children with disabilities (physical, mental and emotional) and their families in order to give them a rare and much-needed and deserved break, to have fun as a family and enjoy activities that are catered towards families that have such unique and seemingly insurmountable limitations. The stress placed on a family with a child with disabilities is unbelievably high. The divorce rate is through the roof. My assistant, Karen Priest, spent a week at camp serving as a camp counselor and said it was probably one of the best, most meaningful weeks of her life. Last summer Jerry asked me and about eight resonate guys to come up and spend an afternoon at the camp about two hours away to grill steaks and hang out with the dads and thank them for loving their families. We had a terrific time hanging out and getting a tour of the camp. This year Jerry approached me and asked if I would be willing to help out at camp this year. Jerry said that camp scholarships are required for many families to be able to attend for the week, since many of them face high medical bills. "J.R., would you be open to shaving your head for a good cause? If we met our huge goal of $3,000 for scholarship money for families with disabilities to go to camp would you shave your head bald with me?" I said it was a crazy idea, but crazy ideas are worth doing if the causes are worthy enough. The agreement: if $3,000 dollars is pledged between now and the end of April for camp scholarships Jerry and I will have our heads shaved completely bald. 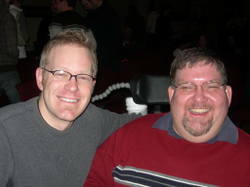 Here is a picture of Jerry and I taken about two weeks ago. We still have hair as of now. We might look different in the future. I have a funny shaped head. But go ahead: I dare you to make me look ugly. Would you consider helping out the Bortons and families with disabilities through the Philly chapter of Joni and Friends with summer camp scholarships? You can donate through the resonate blog here. Make checks available to: "Philadelphia Director's Fund" or "The Head Shave Challenge." (Of course, all donations are tax deductible). UPDATE: Jerry and I announced the Challenge at resonate last night. 45 minutes after resonate had finished, Jerry came up to me and said that $740 was already given towards the fund. Jerry said, "You better get a ball cap because your head is going to be cold..."
My friend James Chester (formerly of the band of the James Chester Band) and his musical posse have reinvented themselves and are now a band by the name Wakeup Sleeper. They've got a good sound and you should hear them. 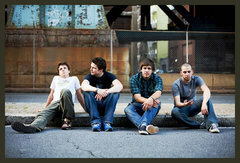 Check out their website and listen to some of their music on their myspace page. Our friends Todd (who pastors The Well) and Melanie Hiestand have been waiting to adopt a baby boy from Guatemala for several months. It's been a long, excruciating process, waiting for all the paperwork to go through, but two weeks ago they got the official call to head down and pick up their son, Mason. They've spent the past five days in Guatemala City sorting out the final paperwork and spending a lot of time at the pool bonding, hanging out and getting to know their new son. 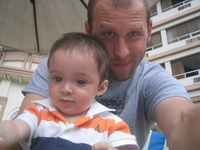 You can check out Todd's blog for updates on the entire adoption process from Guatemala. We can't wait to meet Mason and we can't wait to give Todd and Melanie a big hug. God is faithful. One of my closest friends in PA, Scott Hackman, had a God-sized vision to start a fair trade coffee business that had a holistic approach to ministry by working directly with farmers in Central America and Africa and using the profits to benefit a Kingdom organization called the MAMA Project. It's a creative business approach to seeing the kingdom of God advanced. I'm proud of Scott taking this huge risk to care for the poor and extend justice where it has been lacking. This dream birthed the reality called One Village Coffee, impacting the world one foreign village at a time. It's coffee with a cause. The website launched this week. Check it out here...and purchase a few bags of coffee while your at it.